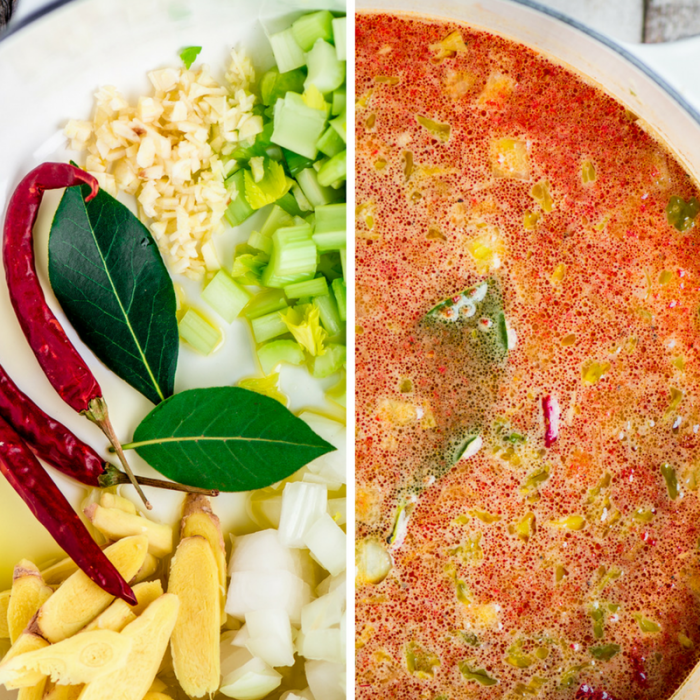 This revitalizing weight loss soup is satisfying and delicious. I don’t know where I’d be without it ~ probably a few pounds heavier, that’s for sure! *This post is in partnership with Swanson® ~ thank you for supporting me and the brands I work with, I’m super choosy and promise to bring you only the cream of the crop. This isn’t the dreaded cabbage soup diet in disguise, I promise! This soup is near and dear to my heart, I turn to it whenever I feel like the pounds are creeping up on me. It’s my ‘real food’ way to get back on track with healthier eating, without resorting to pills or gimmicks. 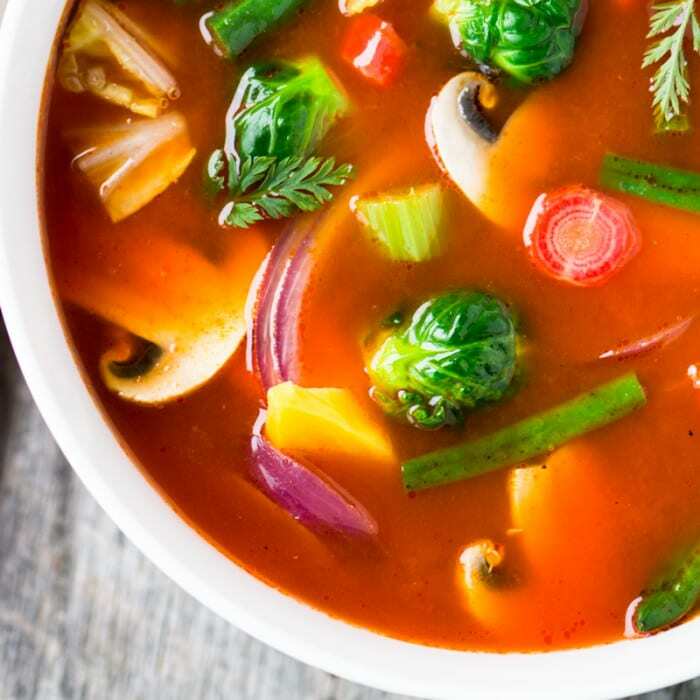 After a few days eating this soup you’ll feel better about yourself, and be more motivated to make the right food choices going forward. Years ago my husband Grant got suckered into that infamous cabbage soup when it was making the rounds. His college roommate Rob convinced him it was a miracle diet and I can still remember cooking up huge vats of it. It was pretty awful, especially after a day or two in the fridge. This soup is a whole different ballgame, it’s got a much richer flavor profile and tons more texture. Oh, and my soup does include cabbage ~ in the form of bright emerald green brussels sprouts! I make it fresh every couple of days because if the soup isn’t appetizing, it’s not going to be effective. 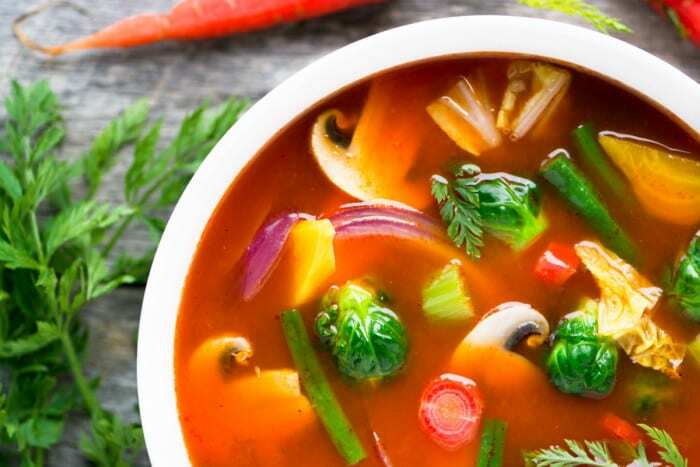 This soup has a low calorie density, meaning it has very few calories relative to its bulk. 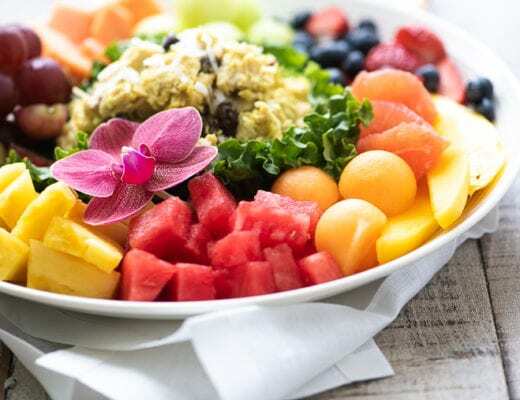 It’s hydrating, loaded with fiber, and gives you that full, satisfied feeling in your belly ~ it helps beat the bloat, too! 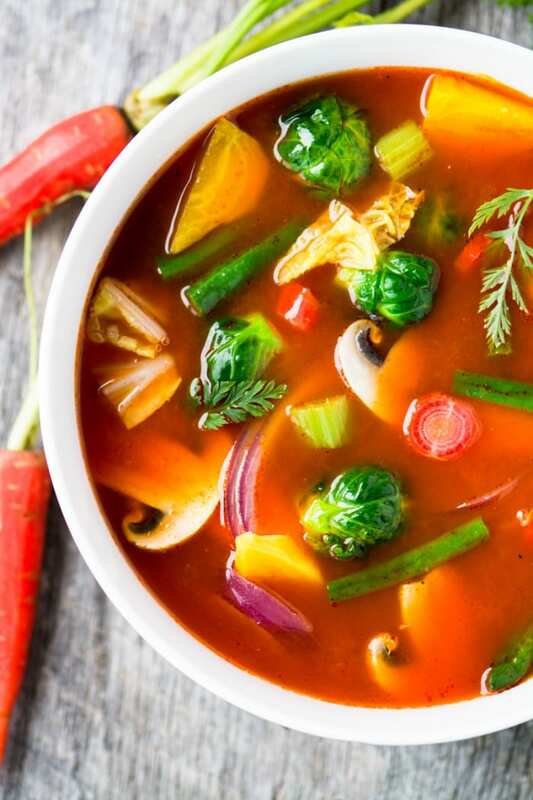 This applies to most clear broth based vegetable and lean protein recipes, but not to creamy or cheesy soups (sorry, you’re not going to lose weight on lobster bisque). What I love about this soup is that I can eat as much as I want…if I’m not full after one bowl, I can have another. My routine is simple: I either have a normal breakfast and lunch, and eat soup for dinner, or I have the soup for breakfast and lunch, and have a normal dinner. I alternate so I don’t get bored. TIP: A great flavorful broth is essential to this soup. I use the new Swanson Organic Free-Range Chicken Broth as my base. 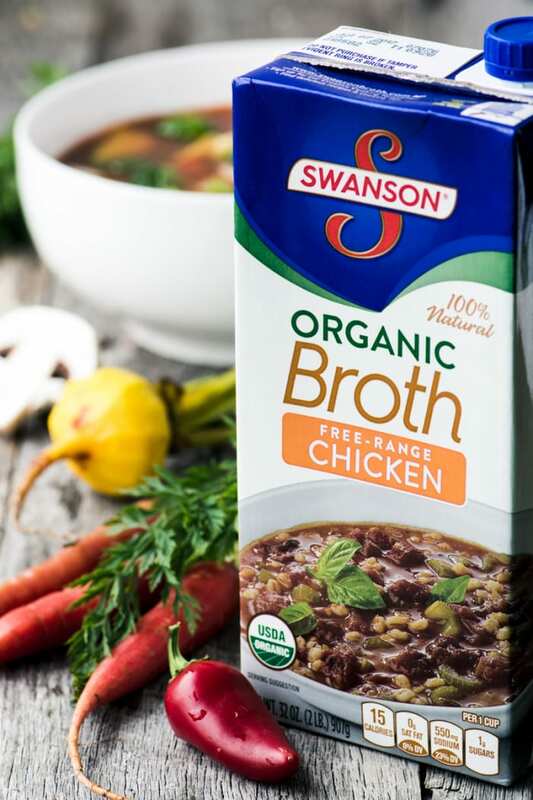 Swanson 100% natural broths are made from all natural, organic vegetables and free-range chicken raised with no added hormones or antibiotics, and just make sense for this kind of healthy recipe. I love that Swanson is constantly innovating and adding new products to their line. I’m a big believer in supporting free-range, so I’m thrilled to have this choice for my recipes. For my winter weight loss soup I make the broth first. I’ll store it in the refrigerator, or freeze larger amounts. That allows me to make a fresh batch of soup every couple of days ~ all I have to do is chop a variety of veggies and throw them in. TIP: You can freeze the broth in plastic or glass containers…be sure to leave space at the top when you fill them to allow for expansion. When I’m ready for soup, I simply heat the appropriate amount of broth in a pot, and add my chopped veggies. I bring it up to a boil, then cover and turn the heat WAY down. I let it sit for 20 minutes, barely at a simmer. When the veggies are just tender, it’s ready. And my secret touch? A shower of grated Parmesan cheese in each bowl. It makes such a difference. TIP: For this soup avoid high carb vegetables like potatoes, corn, lima beans and peas. I do use beets, which are technically high in carbohydrates but are also super healthy. To make the broth, heat the olive oil in a large soup pot and add the onion, celery, garlic, ginger, crushed peppers and bay leaves. Saute on medium low for 20 minutes, stirring often. Don't let it brown or burn, you just want to soften everything and get their juices flowing! Add the turmeric, broth, pureed tomatoes, paste, and vinegar to the pot. Season with the salt and pepper, mix well and bring to a boil. Turn the heat down, cover, and simmer gently for 45 minutes. Taste now and adjust any of the seasonings. 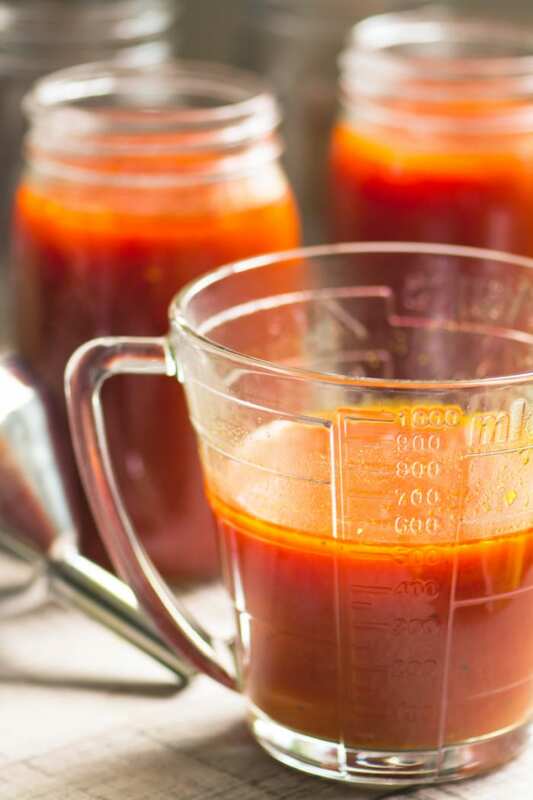 Strain the broth and store in the refrigerator, or freeze, until needed. When you're ready to make soup, bring the broth to simmer in a soup pan. Use approximately 1 cup per serving. Add the veggies EXCEPT the cabbage, spinach, or kale, bring back to a boil, and then turn the heat way down, and cover. Let the soup sit for 20 minutes. It should barely be at a simmer. Stir once or twice. Stir in any leafy veggies like the cabbage last, after the soup has cooked. The heat of the broth will be enough to wilt them. Serve hot with a sprinkling of cheese. don’t forget to pin this weight loss soup recipe! If I am going to eat the soup immediately do I really need to strain it? No, if you prefer not to strain it that’s perfectly fine Velma. Hi! Making the broth right now. When you say a cup of veggies for a serving, do you mean a cup total including all veggies or a cup each making a batch- sorry, i just want to be sure ? I just meant it as a general guide, so if you’re making soup for 6, be sure to include about 6 cups of veggies. Thanks! I am so excited to have this recipe! I love love the broth already!!! ? Approximately, how many calories are there per serving? How many servings is this recipe ? This will serve about 8-10 Jackie. This sounds amazing… Cannot wait to try it out..
Beautiful soup and tastes lovely! BTW it doesn’t freeze well as a complete soup as you said before however it cans beautifully. I live off grid and stocked up on this soup. Exercise isn’t that easy with 3 feet of snow so a healthy soup is perfect for my winters. Thank you for sharing! Wow, thanks for your feedback Tara ~ your life sounds fascinating! This is amazing. I would never have thought of putting turmeric, vinegar, and ginger in vegie soup (you know, used to traditional thyme, sage, blah blah). I am currently trying to shift my focus from “diet” to super food healthy. This completely fits the bill. As to the super food focus, it is so easy to stay on. All the delish things in this soup, berries, your oat bran bowl, shaved salads. I am so glad I found your blog. It’s one of my faves and it’s keeping me enthusiastic about healthy. We love Swanson products. Use them regularly. I love this soup. It’s honestly the most gorgeous soup I’ve ever seen. Yup – I need this!! Hi-Any thoughts on what I would prefer to do which would be make a big batch (of the whole soup, not just broth) and portion it and freeze it that way? I tend to do this for all soups/stews…anyone tried it for this recipe? Maybe someone will weigh in on this AM, but personally I don’t feel that vegetable soups freeze well, everything tends to get mushy. I am craving this warm bowl of comfort! Bring on the healthy winter soup! Love this! Sue I love this soup, I love all your recipes, but I’m so excited about the free-range broth! I’m a big believer in the cause, I buy free range eggs, and chicken, and it’s nice to see big companies like Swansons getting onboard. Thanks for posting about this! I’m so glad you said that, I totally agree! Holy smokes, Sue – such a gorgeous soup and so full of goodness! I love all the ingredients and I think ginger is magic. I made a ginger and cinnamon tea over the holidays because I was sick with pneumonia and I’m sure it saved me, lol. I’m going to make a big pot of this for the weekend so I can slurp on it while I watch football. Made this tonight – delicious! Used vegetarian broth, brussels sprouts, beets, cauliflower and mushrooms. Very satisfying on a frigid night here in New Jersey, thank you!!! I thought I *was* going to lose weight with that lobster bisque I’ve been eating… ;) My yoga pants thank you for this soup! One of use has to come up with a ‘skinny’ lobster bisque, Laura! That broth is good stuff and your soup is full of good stuff. Pinning! After all the food this holiday season I NEED this soup. PS: my fingers kept typing “fater” instead of “after.” It’s a sign. When you say beets do you mean beetroot? The soup looks delicious. I live in Australia so we are in the middle of our summer – so what – the soup looks so good might have to make it!! Hi Kate, yes, beetroot. I always love hearing from my readers in the other hemisphere ~ I wonder if you could make this into a spring primavera soup! I so need this right now. I ate cookies everyday all day over the holidays! Thank you for sharing another option besides cabbage soup Sue.I NEED this! Looks deliciously healthy! My stretched out stretchy pants thank you! I could definitely use a bowl of this to get my healthy eating habits back on track after the holidays. 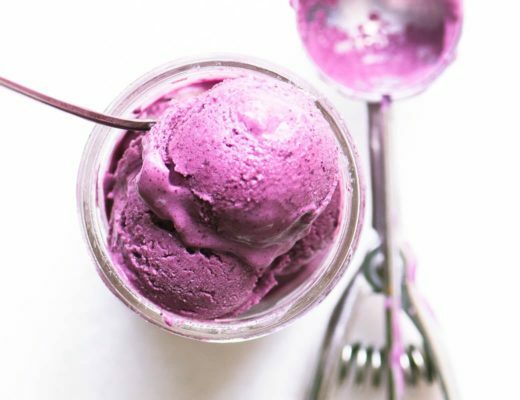 What a great recipe to help get rid of the sweet cravings and get back to craving healthy and fresh! Hey Sue, this soup looks delicious! And it’s perfect after the holidays- I could shed a few pounds. 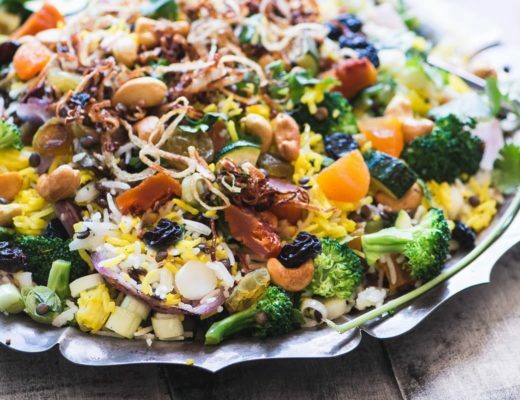 Love all the vegetables in this one! Have a great day! This is EXACTLY the kind of recipe my body is crying out for following all the Christmas excess. Wonderful rainbow of colors straight from nature. Sounds delicious. That’s a great way to put it, Claire…our bodies really do cry out for this kind of thing in January ~ thanks for stopping by! I would eat soup 5 times a week if I could get away with it! My husband is not a fan. I love all the ingredients in this soup, except the Brussel sprouts, but I can substitute that! I love that this soup helps one lose weight! I, cough, could use that. This is very much needed after the holidays season! 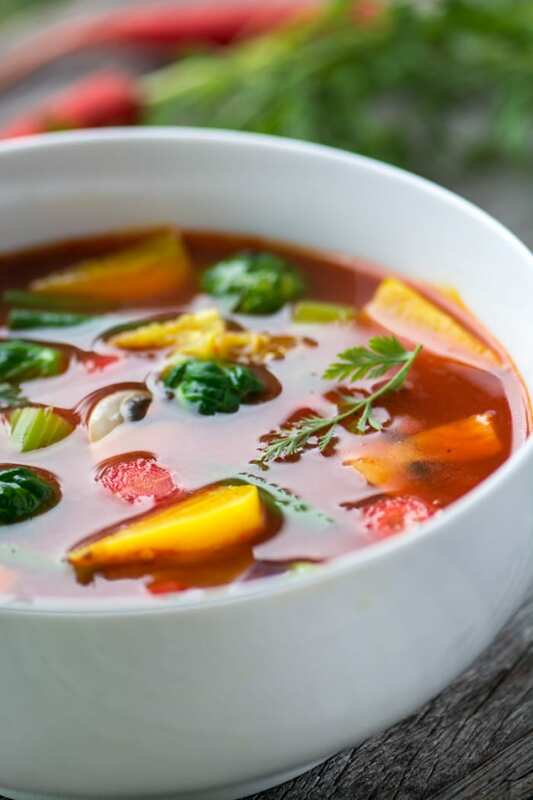 reminds me of the cabbage soup diet, but this soup looks much better! I’ve totally tried *that cabbage soup* and this looks sooooo much tastier! I am in serious need of this soup after December. I can’t wait to try it. Pinned! This is all I need right now! In fact, I just made something similar for my family and we’ve been enjoying it for the past couple days! I’d feel better just looking at this beautiful soup in front of me. And being a veggie lover, I know it would be no sacrifice to enjoy this for breakfast, lunch or dinner! Love your tip on how to make the broth ahead yet keep things fresh. Hey Sue! This soup looks delicious. Is it the beets that give it that amazing deep rich color? All the vegetables look wonderful – and I guess I could live without the potatoes for a healthier bowl. This kind of meal really does make me feel so much better. Have a terrific week! Seriously, I would eat everything, anything you cook, weight-loss or not..this soup looks so flavoursome and warming!